Before moving on to the symptoms of preeclampsia you should know what preeclampsia refers to. It actually means high blood pressure during pregnancy and elevated levels of protein in the urine. During this time of women’s life even the smallest changes of blood pressure could indicate the presence of preeclampsia. You should know that the condition could appear slowly or abruptly and usually it appears after the 20th week of pregnancy. The condition could be mild or quite severe. 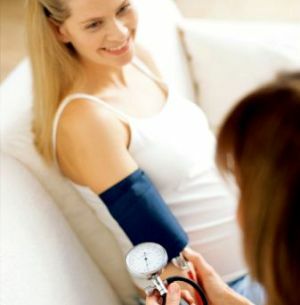 In case your blood pressure was normal before you got pregnant, then the preeclampsia symptoms include high blood pressure. This should be measured at least two times, in a time period of at least 6 days. Some other symptoms of preeclampsia include too much protein in the urine, headaches, vision changes, loss of vision for a limited period of time, light sensitivity, blurred vision, pain in the upper abdomen, vomiting, nausea, decreased urine, dizziness, and weight gain of more than two pounds per week. The characteristics of preeclampsia also include some swelling, especially in case of the hands and face. Although this is considered to be a sign, it isn’t a specific one, because there are some women who experience this one of the symptoms as a normal sign of pregnancy. In case you experience the symptoms of preeclampsia like blurry vision, severe headache and severe abdominal pain then you should contact your doctor at once. The truth is that the nausea, headache and other aches and pains are common in case of pregnant women so sometimes it is difficult to distinguish the preeclampsia characteristics from the normal symptoms of pregnancy. This is especially difficult if you are pregnant for the first time. If you are concerned, you should talk to your doctor. In the past the condition was also known as toxemia because people though that there is some kind of toxin released into the bloodstream of pregnant women. When thinking about the signs that are specific for preeclampsia you should also know that the condition could be caused by little blood flow to the uterus, damage of the blood vessels, poor diet or an immunological problem. In case you are considering the symptoms that are specific for preeclampsia you should know that they are similar to the symptoms of gestational hypertension, chronic hypertension and chronic hypertension linked to preeclampsia. The risk factors might be connected to the signs of pregnancy high blood pressure. One of these is a history of the condition. In case you or someone else in your family had preeclampsia before, your chances of being affected by it increase. The majority of women experience the condition during their first pregnancy. Also in case you have a child with a new partner, the chances of preeclampsia increase again, even if it’s not your first pregnancy. There are numerous symptoms of preeclampsia to look out for and in many cases women don’t recognize them because they are similar to the normal symptoms of pregnancy. Next articleHow and When Do Periods After Pregnancy Occur?